As a solution provider, you want to place your product clearly visible for a broad, professional and growing user group. You can easily achieve that by making your solution available as an app in the Univention App Center! Derive benefit from the wide distribution of Univention Corporate Server (UCS) across thousands of organizations, an audience with high-affinity to products from the App Center and the platform’s continued growth. Provide your solution simultaneously in various cloud offerings (such as Amazon Web Services) and various virtualization formats (such as VMware, KVM). Univention apps are distributed by an ever-growing network of managed service providers. This makes your solution instantly operable on-premises, in the cloud, and in hybrid environments. 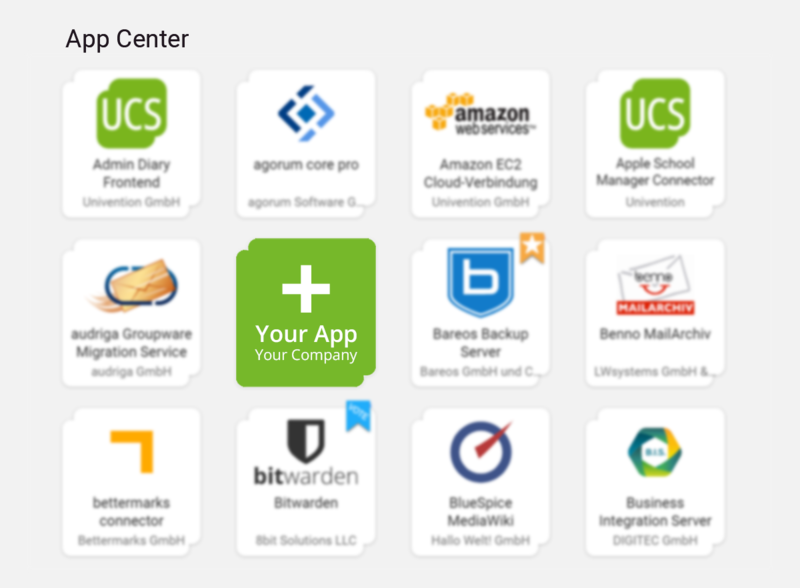 By connecting your solution to the UCS identity management, users and authorizations are managed centrally. This saves the customer from double user administration. With UCS, your solution can be integrated into existing IT infrastructures such as Microsoft Active Directory. Existing information such as user accounts can be used in your solution. UCS is maintained and updated on a professional level by Univention. If required, UCS users can receive up to 24/7 support. You will be informed who operates your solution, allowing you to follow interesting leads. You will also receive analyses of the performance of your Univention app. In addition and without extra effort, your solution can also be provisioned as a virtual app appliance in your own branding, providing in particular testers with an easy access to your solution. As an app provider, you also receive a UCS subscription for internal use at attractive conditions. Ask for an access to the App Provider Portal, provide marketing information about your solution, and upload it as an app.